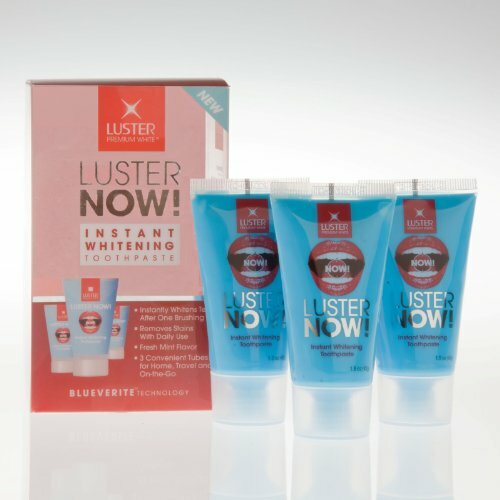 EWG scientists reviewed Luster Premium White NOW! Instant White Toothpaste (old formulation) for safety according to the methodology outlined in our Skin Deep Cosmetics Database. We assess the ingredients listed on the labels of personal care products based on data in toxicity and regulatory databases, government and health agency assessments and the open scientific literature. EWG's rating for Luster Premium White NOW! Instant White Toothpaste (old formulation) is 3. Adults and children 12 years of age and older. Children under 12 years of age ask a dentist or physician. Brush teeth thoroughly, preferably after each meal, or at least 2 times a day. If you have excess blue toothpaste on your gums, you can simply rinse with water for few seconds. WarningsKeep out of reach of children under 12 years of age. If you accidentally swallow more than used for brushing, seek professional care or contact a Poison Control Center immediately. Avoid eye contact with eyes.